UPDATED: Fri., Feb. 8, 2019, 5:41 p.m. The Nielsen family tree resembles a spine, with five generations of chiropractors and the hope that the tradition of helping people stretches on like a good adjustment. Kristina Nielsen, who graduated in 2016 with a Doctorate in Chiropractic from the University of Western States in Portland, is the 13th chiropractor in her family. She works in Spokane with her parents, Blake and Kim Nielsen, who are both chiropractors and also graduates of the same university. They have treated local residents since opening North Spokane Chiropractic in 1994. Today, Kristina and Kim both work at the north office while Blake works at their downtown office in the Paulsen Building. Kristina works three days a week downtown as well. The Nielsens thought their daughter would outgrow the idea. As a toddler, Kristina put her dolls on the table for adjustments after pretend falls and proudly did a project on the body and circulation system in fifth grade. From there, her passion for chiropractic only grew. Kim Nielsen’s story is similar. Chiropractic is in her blood. Her father, Sterling Hill, was a Seattle chiropractor. Her mother was a nurse – the long line of chiropractors flows from her side of the family dating back her great uncle Samuel John “Jack” Francis who graduated from Palmer College of Chiropractic in 1923. For a few months as a child, Kim Nielsen wanted to become a radio personality, but then it was back to chiropractic. She liked the relationship her dad had with his patients. At age 18, Kim Nielsen was in an auto accident, spending a month in Harborview Medical Center. Until then, she wasn’t serious about education or her future. The accident motivated her and soon she was at University of Western States, the second oldest chiropractic university in the world. That’s where she met Blake Nielsen. She liked his 1964 El Camino, the same car their son is driving at Washington State University, where he’s studying engineering, not chiropractic. They joke that one of his future children will be a chiropractor. Kristina Nielsen is getting married this summer to an electrician, yet it is possible their future children might carry on the chiropractic tradition. Blake Nielsen came from a medical background, studying cell and molecular biology and doing postgraduate research in the field of cell and developmental biology. He never had been to a chiropractor. He worked as a bio-medical technician in San Diego, certifying and fixing life support and respiratory machines. Then one day he visited a chiropractor across from his house. He liked the guy’s office and the idea of wellness. For some reason, he was inspired to apply to chiropractic schools and re-create himself at age 32. Angela Justice, 40, first started going to Blake Nielsen at about age 12, just like her dad who had had back surgeries. She later became Kim Nielsen’s patient. She feels like family, and all her kids are Nielsen patients, starting as infants. She says there is a difference between all three of the Nielsen’s work, but that they all are great. She described Blake as heavier handed while Kim has light hands. And she is impressed that Kristina is so capable at such a young age because Justice said she is “not an easy cat” to adjust. Blake Nielsen explains chiropractic as nervous system health. Spasms or swelling can affect the flow of information from the spinal cord to the brain, like static on a phone line. A chiropractor uses mechanical force to stimulate the tissues or stretching the soft tissues and that stimulates the nervous system, clearing up the communication line. Chiropractic is made up of philosophy that is the mind-body connection, science of nerve function and art that is the feel, Blake Nielson said. “It’s the combination of those three things that make it effective,” he said. The feel is why all chiropractors, including the three Nielsens, differ on how they adjust patients. Chiropractic has a raucous history and wasn’t always accepted by the medical community even though it is now mainstream in today’s health care system and accepted by insurance. Daniel David Palmer performed the first chiropractic adjustment in 1895 and founded the first chiropractic school, known as Palmer College of Chiropractic, in 1897. Palmer emphasized the role of the patient’s body and its innate healing ability rather than medical treatment by doctors. Chiropractors were jailed and medical doctors lobbied that the art wasn’t scientifically based, even though at the time medicine wasn’t any more scientific. The American Medical Association even established a Committee of Quackery in 1963, in which the chairman said that “rabid dogs and chiropractors fit into about the same category,” according to a June 2011 article in the AMA Journal of Ethics. Most states didn’t have licensure for chiropractors. It took an antitrust lawsuit filed against the AMA in 1976 to reveal the magnitude and scope of the AMA’s plan to eliminate the profession. Kim Nielsen said her father, Sterling Hill, was actively involved in the lawsuit and fought for chiropractic rights. Francis, the family’s first chiropractor, fought the fight too long before the antitrust lawsuit. He authored numerous books on the benefits and philosophy of chiropractic. The Nielsens only own “Keys to Self-Understanding: Volume 3” written in 1972. Today, there are 70,000 active chiropractic licenses in the United States, according to American Chiropractic Association and an estimated 50 million Americans see a chiropractor each year, according to Palmer College of Chiropractic in Iowa. 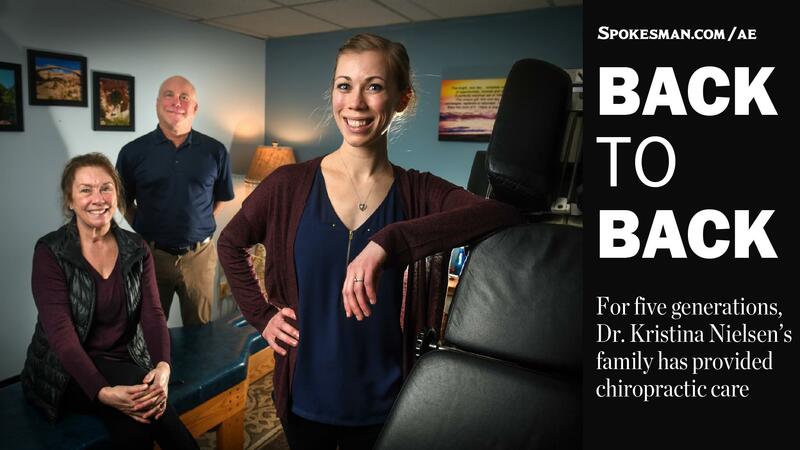 Although chiropractic is now common, not all patients are used to young doctors like Kristina Nielson, who is 26 and a 2010 Mt. Spokane High School graduate. New patients are often taken aback by Kristina’s youth. She is slight and bubbly, resembling a teenager perhaps more than a woman with her Doctor of Chiropractic degree. It seems impossible that she could adjust a 200-pound man, but she does, with no problem. Afterall, strength isn’t the point. Her parents say Kristina has gifted hands with excellent feel. Kristina jokes with patients that’s she’s been adjusting since age 3. She has the photo to prove it, an old Polaroid in which teddy bears and dolls are lined up face down on the kitchen floor with a tiny Kristina not much bigger than the toys getting ready to treat her patients. Longtime patients remember when Kristina was the office greeter, a baby in a bassinet with a sign pinned on it asking people to sign in. Published: Feb. 8, 2019, 5:41 p.m. Updated: Feb. 8, 2019, 5:41 p.m.